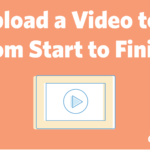 ﻿ How to Upload a Video to YouTube from Start to Finish » Red Mango Marketing! More than 1.5 billion users log in and watch videos on YouTube each month. That’s one important reason why crafting videos for your audience on YouTube can be a very rewarding experience for your small business or nonprofit. Another is that by sharing videos that inspire, educate, or entertain, you can build a community and get more people talking about your business. But before you can start using YouTube to your advantage, you first need to learn the basics. In this post, I will walk you through the steps you need to follow to upload a video to YouTube, and introduce you to some valuable features YouTube has to offer. The first thing you will want to do is to log in to YouTube. To do this, you’ll need to set up a Google account if you do not already have one. 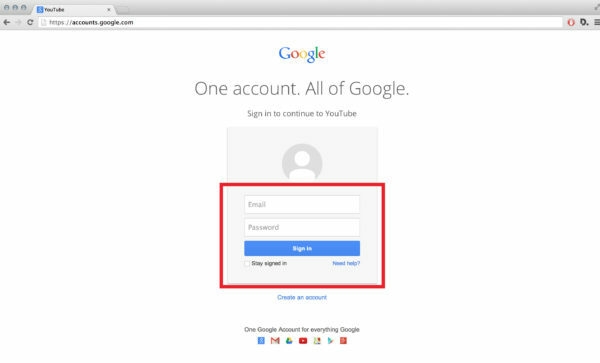 Your Google account can be used for YouTube, Google+, Gmail, and any other YouTube platforms. After logging in to YouTube, choose the upload arrow button near the upper right hand corner of the page. From there you will be taken to the Upload page. It’s important to set the privacy before uploading videos you do not want available to the public or visible on your channel. Public: Anyone can see your video, it can appear as a suggested video, and will be listed in the Videos section on your channel. Videos that you are sharing to educate, create engagement on social media, promote your brand, or give your audience an inside look at your business or community are best served by the Public setting. Unlisted: This means that only people who have a link to the video can watch it. When someone clicks the video section of your YouTube channel the video will not be discoverable. Unlisted videos do not appear in YouTube suggested views or in YouTube search results. Utilizing the Unlisted privacy setting allows you to share certain videos only with the people who will find it relevant. Private: Videos with the Private setting can only be seen by you and the users you choose to see the video. Private videos do not appear on your channel and are undiscoverable from all users. Scheduled: This privacy setting uploads the video to your channel but makes it so the video is not seen by the public until the date and time you choose during upload. This setting allows you to plan out a video campaign or series without having to upload each video individually. Once you choose your privacy, click the big arrow button and select the video you want to upload from your files, or simply drag and drop the file. Tip: HD videos are best for your channel. You want to upload a video with dimensions that are either 1920×1080 or 1280×720. Having a crisp, clear video gives people the impression that you are professional and that your content should be taken seriously. While the video uploads to your channel, you can see its progress on a status bar. Once uploaded, the video then has to process. You can see the progress for that in the status bar as well. Your title is the most important piece of information you will provide about your video. You want to make sure the title of your video is relevant and you should keep in mind what people might be searching for. You don’t want the title to be vague or difficult for someone to figure out what your video is about. The title is what Google values the most when ranking your video in the search results page. It’s also important to add descriptions and tags to your videos. You want to include keywords in your description that will help your video get ranked higher in search results. The more relevant information you can provide to YouTube in your description the better they will be able to rank it. Tip: While your video is uploading, if you have the privacy set to Public, you can check off the Google+, Facebook, and Twitter buttons to automatically share your video on those networks when the upload is complete. YouTube generates three choices of thumbnail images for you. The thumbnail image will be seen on your channel, playlists, suggested video previews, and also anywhere your video is embedded. If you do not like any of the YouTube generated choices, you can create your own image to use. The recommended size for these images is 1280×720 pixels. Be creative with your thumbnail image; it should convey what your video is about and look professional. To upload a custom thumbnail click the “Custom thumbnail” button. Now that you have uploaded your video, you can go to its dedicated YouTube page. Your video now has its own URL, where users can like, comment, and share your video. From the video’s page you can also access settings, enhancements, audio, annotations, and closed captions. You can also view the video analytics or go to your channel video manager from this page as well. This page also serves as a jump off for social sharing (across thirteen platforms). It provides the code to embed your video and an option to email the video to someone directly from the video’s page. You have successfully uploaded a video to YouTube! Now what? There are a few things you can do to get the most out of your video, like adding annotations, encouraging users to subscribe to your channel, linking your Google+ account to your YouTube channel, and more. You’ll also want to dive into the analytics for each of your videos to find out what type of content your audience is responding to the most. You can learn a lot about your audience from the numbers they generate on YouTube. Remember, YouTube is a social channel and your videos should reflect that. Don’t scare people away from your small business or nonprofit by just trying to sell to them on YouTube. Instead, provide them with engaging content that will make them want to come back for more! Editor’s Note: This post was originally published in September 2014 and has been updated for relevancy and accuracy. This entry was posted on Tuesday, September 26th, 2017 at 8:00 am	and is filed under Google+, News & Updates, small business marketing, Social Media Marketing, video marketing, YouTube. You can follow any responses to this entry through the RSS 2.0 feed. Both comments and pings are currently closed.